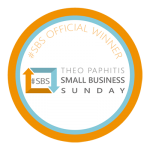 Each week, Theo Paphitis rewards small businesses that tweet him @TheoPaphitis and describe their businesses in one tweet including the all-important hashtag #SBS. Only tweets made in the time slot between 5.00 PM and 7.30 PM each Sunday count. Every Monday night at 8pm, Theo reviews and chooses his favourite lucky six who are then re-tweeted. As he has over 476k followers, this provides a massive boost to the chosen lucky businesses. For more information, go to http://theopaphitissbs.com/ to become a winner too!